China’s decision to block the listing of Jaish-e-Mohammad chief Masood Azhar as a global terrorist at the UN Security Council is both a setback to India’s post-Pulwama diplomatic strategy and a reality check on ties with China at present. Despite weeks of a diplomatic campaign after the Pulwama terror attack, China’s decision to place a “hold” on the United Nations Security Council (UNSC) listing of Jaish-e-Mohammad chief Masood Azhar as a global terrorrist has come as a setback to India. It will force New Delhi to reconsider its strategy on the issue and consider various options and priorities ahead. After the February 14 attack, claimed by the JeM, the government had made the listing of Azhar a focus in its diplomatic efforts. It reached out to several governments, and shared a dossier on Azhar with each member of the Security Council, who are all members of the 1267 ISIL and al-Qaeda sanctions committee. A special effort was made with Beijing, which has blocked the Azhar listing in the past, including just after the 2008 Mumbai attacks. Brief Background on the issue: How often has China blocked UN action against Jaish-e-Mohammed terrorist Masood Azhar? 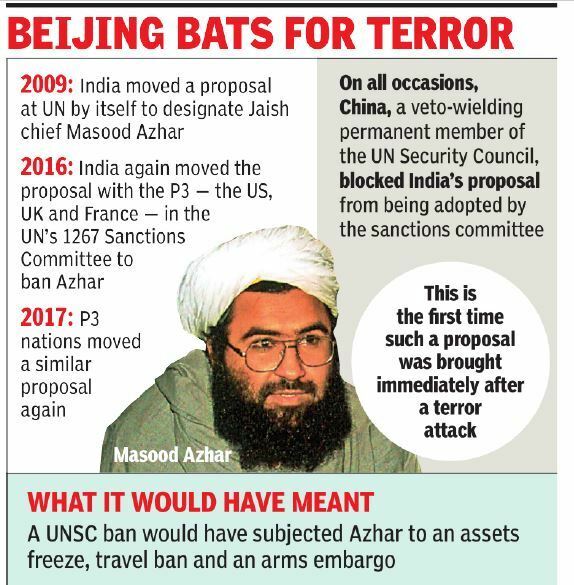 In the last 10 years, China has repeatedly blocked India’s listing proposals at the United Nations Security Council (UNSC) Resolution 1267 sanctions committee to designate Azhar as a global terrorist. Beijing blocked it for the first time in 2009, after India had moved the proposal in the aftermath of the 26/11 Mumbai attack. In February 2016, after the Pathankot attack, India put forward a fresh proposal. China intervened at Pakistan’s behest and placed a technical hold on India’s move, and did so again in October 2016. It subsequently used its veto power to block the proposal in December 2016, a day before the end of the technical hold. Following a proposal by the US, the UK and France on January 19, 2017 to designate Azhar as a terrorist China once again employed a technical hold and blocked the proposal in November 2017. What does China gain by repeatedly frustrating India and the global consensus on fighting terrorism emanating from Pakistan? China has always used Pakistan, as senior Indian officials say, a “strategic weapon” against India. This is reflected in Beijing’s blocking of the Azhar proposal. For China, Pakistan is an “all-weather ally” and an “iron brother”. It has strategic investments in Pakistan, including the China-Pakistan Economic Corridor. For its all-weather friend, it is ready to take a hit on its reputation, even if it means that it is perceived to be standing on the wrong side of the global fight against terrorism. Beyond the listing of Azhar, China has also been blocking India’s aspirations to become a member of the Nuclear Suppliers Group. New Delhi took up this matter vigorously in June 2016, when then Foreign Secretary travelled to Seoul to held discussions with key NSG members. If the Government of India wishes to make China change its stand, it must consider a more transactional approach, says former Ambassador to China and Pakistan who advocates identifying issues at the U.N., where China will want India’s support or that of the U.S., the U.K. and France in return. Still others suggest that India should work with other UNSC members to ensure that China is unable to stop the listing process as it has been able to do in the past four attempts to list Azhar. The time has come to focus on the veto power of China in the UNSC being used cynically to oppose global counter terrorism measures. He advocated that the UN General Assembly resolution on five areas of UNSC reform, including the question of veto, be tabled now, especially in cases where the vast majority is held up by one or two members. S. diplomat at the Security Council expressed some frustration at the end of the fortnight’s efforts by the U.S. to convince China on the Azhar question. S diplomats warned that If China continues to block this designation, responsible member-states may be forced to pursue other actions at the Security Council. It shouldn’t have to come to that. After all, Lashkar-e-Taiba chief Hafiz Saeed remains a free man 10 years after he was added to the list after the Mumbai 26/11 attacks. 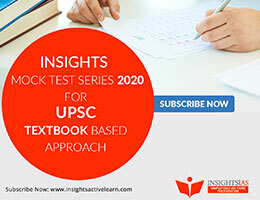 Another track advocated by some is to shelve the Azhar plan entirely, and direct India’s diplomatic efforts towards effecting real actions by Pakistan against terror groups. This time, India not only got the significant three countries to move the proposal but also involved 10 more countries as co-sponsors. Besides the US, the UK and France, which are permanent UNSC members, the other 10 countries included four non-permanent UNSC members – Germany, Poland, Belgium and Equatorial Guinea as well as Japan, Australia, Italy, Bangladesh, Maldives and Bhutan. This helps India’s case that the listing of Masood Azhar is a global cause, and a key element of the global fight against terrorism. The technical hold gives India nine months to lobby with China, so that it lifts the hold and allows the listing of Azhar. India will also need to work all its diplomatic levers so that Pakistan takes concrete and verifiable actions against terrorism. The FATF gives India an opportunity; it can try and persuade the international community to even blacklist Pakistan by May-September this year, if Islamabad doesn’t take action against terrorists and terror groups, including Azhar and Jaish. In 2017, when China wanted to become vice-president of the Financial Action Task Force, India agreed to support its candidature against Japan (a close strategic partner of India), in return for Beijing’s support for Pakistan’s ‘grey listing’. That was a major moment of transactionalism with Beijing. India will need to find such transactional points in the next nine months and a trade-off on a vote or a crucial election, so that it can influence Beijing’s behaviour.